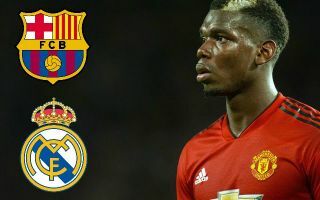 Barcelona look to have the upper hand over Real Madrid in any transfer battle for Manchester United midfielder Paul Pogba in the near future. The France international’s United future has been the subject of much speculation for some time now, with ESPN recently reporting that contract talks between the player and the club have been put on hold. The latest from Spanish source Don Balon is that La Liga’s big two are among the clubs in contention to sign Pogba, but they claim one potential stumbling block between him and a move to the Bernabeu. Pogba’s agent Mino Raiola apparently doesn’t get on well with Madrid president Florentino Perez, which could scupper negotiations, according to the report. Raiola has a reputation for being an intriguing character, having worked with some of the biggest players and on the biggest transfer deals of recent times. Pogba to either Real or Barca would be another huge transfer, but it remains to be seen how this saga will pan out with so many variables at play. The latest among those is that CaughtOffside has learned of Pogba indicating to United that he could stay and sign a new contract with the club if they sack current manager Jose Mourinho and replace him with Zinedine Zidane.